Need a gift for a drummer? With the endless amount of drum equipment, drumsticks, and accessories, non-drummers are sure to be confused by the prospect of buying gifts for drummers. And you thought playing drums was hard. Parents of drum students ask me what to get for Christmas gifts and Birthday gifts. You don’t need to spend a lot for useful gifts that drummers will use every day. For more info about items in this gift guide, see my article, What You Need to Learn Drums. Taking private drum lessons is the best way to learn drums. A true investment in your drummer’s future. Contact me to get started. Or learn more about the value of Drum Lessons. One of the best inventions. Allows a drummer to organize and transport drumsticks. Many have an accessory pocket for ear plugs, drum key, pencil, and spare parts. A metronome is a device that produces a click at a steady tempo for drummers to reference the speed of music. Using a metronome while practicing helps train a drummer to play a steady beat. The ability to play a steady beat is a highly desirable skill for drummers to have. This is a skill that needs to be developed. The Korg MA-1 is what I recommend as a first metronome. Advanced drummers will appreciate a more sophisticated model, which they can graduate to in a few years. I use a drummer-focused metronome like the Tama Rhythm Watch. I advise against decorated drumsticks because the quality is poor compared to plain wood drumsticks. However, if the pretty drumsticks will excite your drummer and inspire them to play, it’s a worthwhile tradeoff. Drumsticks have the model name or number printed on the drumstick, so you can check what the drummer in your life is currently using. If you don’t know, you can ask your drummer. Otherwise, here’s what I suggest. Drumline: These are two excellent and popular drumline drumsticks. Wood tips or nylon tips? Drummers have preferences. I much prefer wood tips for better drum sound and weight balance. Nylon tips produce a brighter cymbal sound and avoid tip damage which wood tips are prone to when playing cymbals. Drum set players need spare sticks readily available in case they drop a drumstick or need to change sticks quickly. That’s why the stick holder was invented. Most basic stick bags include straps to hang the stick bag on the floor tom. This provides great access to spare sticks, brushes, and mallets. I’ve used a basic stick bag strapped to my floor tom ever since I’ve started drumming. This is why my top 3 recommendations includes a stick bag. The benefits of a stick holder are a) it can be positioned where either hand can reach it, b) it’s smaller than a stick bag. The shortcoming is that it can’t be used to transport sticks because it’s just a holder. A professional music stand is extremely nice to have. Like the kind the school band uses. If supports plenty of books without wobbling. For a lower price, a wire music stand is available. I got by with a wire stand for years. It can’t hold as much music, can be wobbly, and may not raise as high. The options are endless. I’ve classified this as FUN because it’s hard for anyone other than the drummer’s teacher to know which lesson books your drummer is ready for. Drum set players may enjoy exercises or transcribed drum parts from their favorite band. There are tons of free drum videos on Youtube. Videos are a great way to increase your understanding of drumming. It is crucial for drummers to use hearing protection at all times. Make it easy for them to protect their hearing with a continuous supply of quality earplugs. Since ear plugs are not exactly a drum gift, consider pairing this with something special or fun. Recommended Ear Plugs for Drummers. While ear muffs are the second-best hearing protection, they are convenient for practicing at home and ideal for drum lessons. They generally cannot be used in live performances, such as school band and orchestra concerts, pep band, or marching band. The 3M X-Series 27 dB in Chartreuse are great for students. I currently use the 3M Peltor Optime 105 and consider them the best. These are not the most glamorous gifts for drummers, but hearing protection is essential for any drummer planning to make a career of drumming or music. Unless you know your drummer wants ear muffs, consider pairing this gift with something special or fun. I use hearing protection every day. Hearing damage is permanent. Learn more. Drum set players spend a lot of time sitting on their drum stool (throne). For beginners and children, any decent throne will do. For serious drummers, I professional-quality throne is recommended. I’ve experienced back pain using thrones which were ill-fitted or wobbly. A good drum throne will last 10-20 years, so it’s worth investing in a nice one for the serious drummer. Ideally, your drummer can try out several thrones before choosing one. The standard cymbal configuration for drum set is a hi-hat, a ride, and a crash cymbal. If a drummer has progressed (1-3 years), they may be ready to expand or upgrade their cymbals. The first add-on I suggest is a second crash cymbal. It can be the same size or different than the first crash cymbal. If the drummer has the most common 16″ crash, and 18″ crash would be a nice addition. Remember that a cymbal stand will be needed to hold the cymbal, if your drummer doesn’t have a spare stand. Boom stands are generally better than straight stands for crash cymbals. Some entry-level drum sets come with entry-level cymbals. You can upgrade to an intermediate cymbal pack. The Wahun WU 457 is a decent upgrade. Prices go way up as you get into professional cymbals. Remember that a cymbal stand of some sort will be needed for each cymbal. These are fun drum set add-ons. They don’t get as much use as drums and cymbals, but they are affordable. If I had to choose one, it would be tambourine. But I use them all. Remember to get a mounting bracket if it’s not included. If you’re considering a drum set as a gift, you’ve probably discussed it with your drummer already. If you haven’t, you should, to avoid an expensive disappointment. If your drummer is < 5 feet tall, and will be for 2-4 more years, choose a drum set with a 20″ bass drum, and/or shorter tom-toms. This enables positioning drums for proper fit and comfort. If you still don’t know how to choose a gift for a drummer, ask your drummer. Chances are there’s a few things on his/her list already. It’s a great way to know for sure what gift to get your drummer. 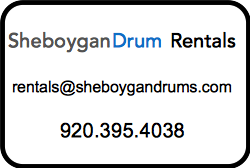 This entry was posted in Drum Equipment, Drum Lessons and tagged drum accessories, drum equipment, drummer gifts, drums on December 20, 2017 by Sheboygan Drums.